An exquisite silver Greek Orthodox icon of the St. Basil the Great. St. 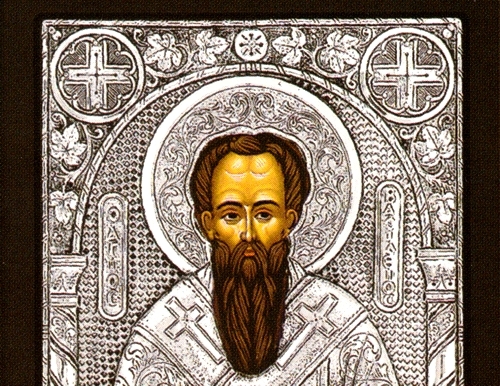 Basil was bishop of Caesarea, a leading churchman in the 4th century. 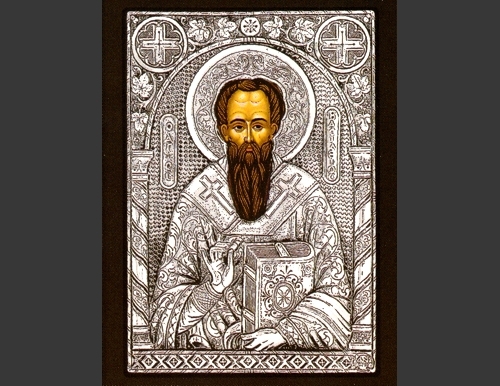 The Church considers him a saint and one of the Three Holy Hierarchs, together with Saints Gregory the Theologian (Gregory Nazianzus) and John Chrysostom. The Roman Catholic Church also considers him a saint and calls him a Doctor of the Church. Basil's memory is celebrated on January 1. In Greek tradition, he is supposed to visit children and give presents every January 1. This festival is also marked by the baking of Saint Basil's bread (Gr. Vasil?pita), a sweetbread with a coin hidden inside.